Winter in Hochkönig Lodge | 760 kilometers of slopes in the Ski Amadé. Winter in Hochkönig Lodge is wonderful. The lodge is located centrally in Ski Amadé with its 760 km skislopes. Ski Amadé is the largest ski area in Austria and consists of 5 linked areas – Hochkönig, Gasteinertal, Salzburger Sportwelt, Schladming-Dachstein and Grossarltal. 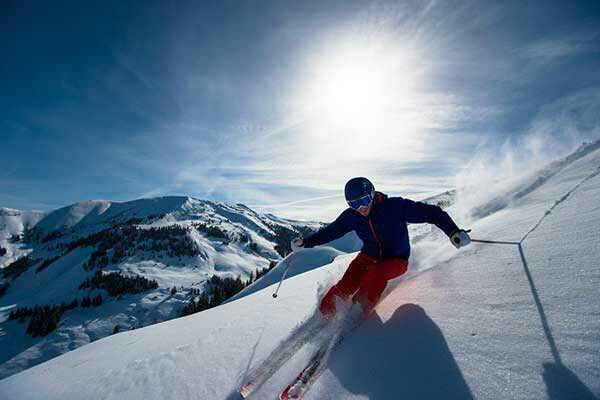 You can enjoy all Ski Amadé has to offer with one ski-pass. Hochkönig Lodge is situated in Mühlbach am Hochkönig. The ski area Hochkönig has 120 km ski slopes. The size of the Hochkönig ski-area is great for beginners and experienced skiers, and especially suitable if you are on holidays with a group of friends or family with all different levels of experience. It is very easy to meet each other for lunch or for the apres-ski, but still enough challenge for the experienced skier. The ski area offers great views of the Hochkönig massif (2941 m), and the villages Dienten, Maria Alm and Mühlbach are connected with high-speed modern lifts and a free skibus. The area also offers various cozy places to enjoy your kaisersmarren or apfelstrudel. The lifts and slopes in Hochkönig area are designed as such that you can ski from one side to the other without taking a slope or lift twice. This is called the Königstour. Especially for small children and beginners there is another ski area on the other side of the valley (only 10 minutes drive from the lodge, and also the ski-bus will take you there) – the Hochkeil. This area is not connected to the Hochkönig area, but has everything a beginner and families with little kids need. If you only use this area there is special ski-pass available, which is a cheaper option. Breath in the fresh mountain air. On the high-altitude cross-country trails at the Arthurhaus and on the Dienten Saddle, you will be treated to an exceptional view of the alpine world. Do you prefer classic or skating? No matter which, the main thing is that you’re on the Hochkönig ski trails! 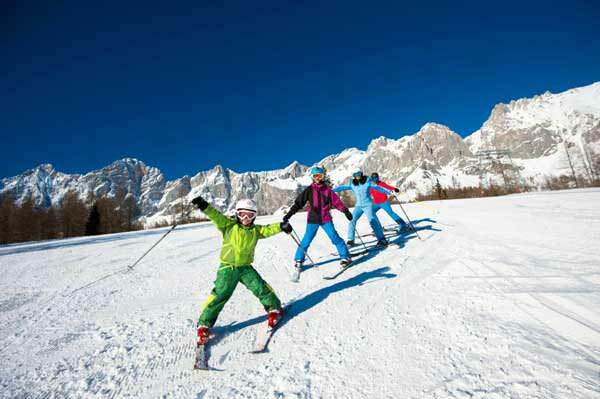 And should those not fulfill your needs; the Ski Amadé area offers over 700 km perfectly prepared cross-country slopes. 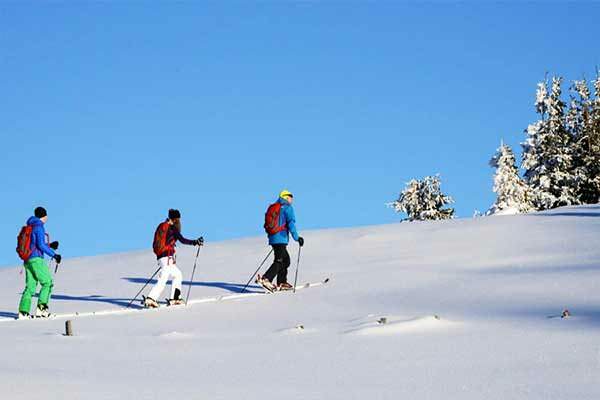 Ski touring in the Hochkönig region is a marvelous experience! The possibilities for touring are numerous: sunset tours on select slopes offered just for ski touring, guided ski tours on the Hundstein (Europe’s highest grass mountain), and a huge area where you can carve down deep snow-covered slopes alone and away from the hustle and bustle. And all of this is offered in the middle of an unparalleled mountain panorama. In high season on Wednesday, you can go into the mountains during the evening. The Tiergartenalm and the Zapferalm keep their doors open, so you can enjoy a nice meal or drink. Apart from skiing, sledging (or rodeln in German) is very popular and for a reason! The close distance to the snow and the relatively high speed together really provides for a fun and exciting experience! There are various “rodelbahnen” in the area, of which the one in Mühlbach is the longest. It is located close to the Hochkeil and 4 km long. The route starts at at Alpengasthof Kopphütte, not far from the Hochkönig Lodge. Hiking is fun, even in winter! The snow crunches under your feet as you cross the glistening and magical winter wonderland. The silence is just amazing and you enjoy the wonderful mountain scenery all by yourself, away for the buzz of the ski slopes. On 85 km of groomed winter hiking paths, you will have plenty of time to enjoy the view of the Hochkönig’s wonderful alpine world. If you have never worn snowshoes before, you can learn how to snowshoe on the snowshoe path in Mühlbach. 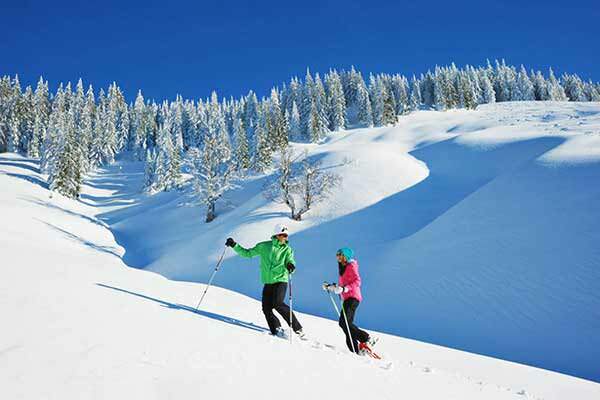 Whether hiking or snowshoeing through the Hochkönig region in winter, you will discover a feeling of exhilaration. 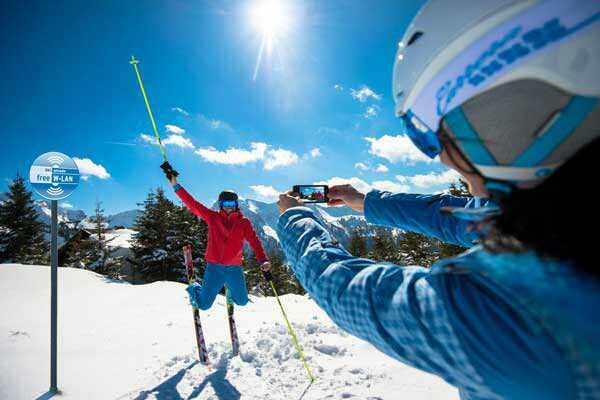 The Hochkönig Ski area offers free Wi-Fi on 12 different spots in the area, mostly around lift stations. In the Kings Cab lift there is even Wi-Fi in every single cabin, ideal for social media enthusiasts! 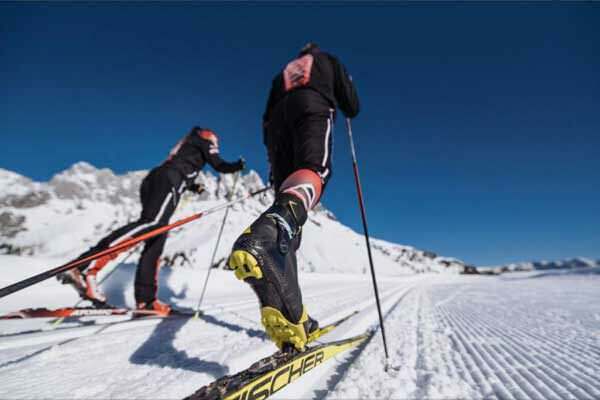 Another innovation for the technology freaks is the possibility of creating your own personal skilog. By entering your skipas number online you are shown automatically your performance of the day; altitude covered, distance covered, route and time. 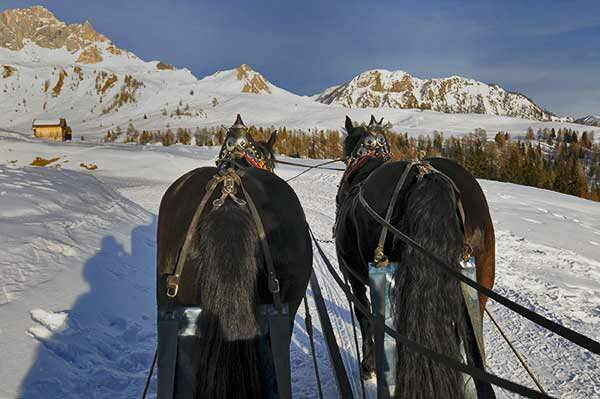 Like in a true Christmas Carol, in the Hochkönig area you have the opportunity of making a sledge ride, pulled by horses. 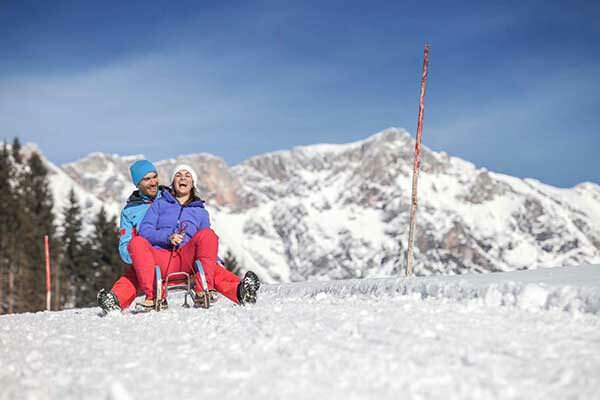 Is there anything more romantic than enjoying the mountain scenery, together in the back of a sledge?